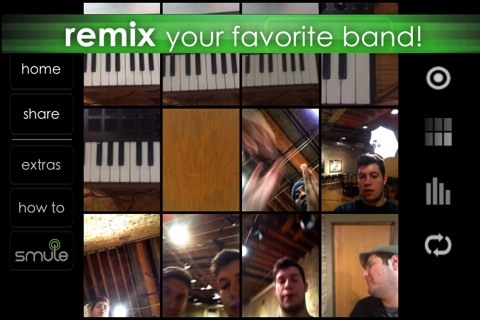 MadPad is an innovative music creation app for iPhone and iPod touch. Smule Inc, a leading creator of musical entertainment apps such as I Am T-Pain and Ocarina have created what is, for my money, their best app yet. 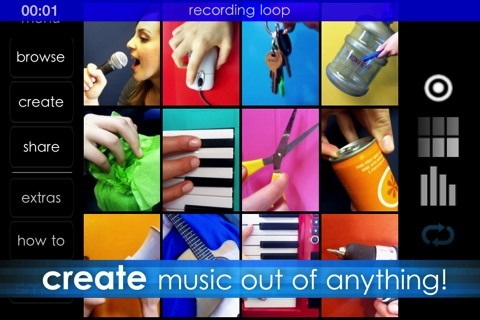 MadPad offers a chance to get creative while having fun turning everyday sounds into your own samples, songs, and beats. MadPad comes with a number of preset templates to mess around with, but the real fun comes in creating your own sets. The clips are organized into a square grid, like a synthpad without any spaces between each pad. First you use your device’s camera and microphone to capture a clip of audio and video. MadPad then has a user-friendly system of cutting your clip to an appropriate start/end point. Repeat this step up to 12 more times and that’s it! You’re now ready to spend hours making all kinds of fun tunes out of your hands clapping, door shutting, dog barking, or significant other complaining about how you’ve just been playing on your phone for two hours. MadPad costs $0.99 on iPhone and iTouch, with an HD version for iPad ($2.99). Older iTouch users beware: if you don’t have a camera on your device then you won’t be able to create your own mixes. You can still play with the preset clips that come with the app, however this feature alone will definitely lack a lasting appeal. As of this time Smule has acknowledged some problems with iOS5, but it shouldn’t be long until these problems are addressed and the app is running smoothly across all platforms. Unlike most other music related apps MadPad offers a concept which goes beyond novelty and creates a lasting appeal. It is very rare to find a music app which appeals to both the tone-deaf and musically inclined alike, but MadPad pulls it off. It is engaging and intuitive enough for the layman to enjoy while having enough creative potential to keep musicians interested. Regardless of your musical capabilities I urge you to download MadPad, go out into your backyard, and start making some funky tunes out of those passing pedestrians (maybe ask permission first), chickens (no permission needed), or screaming bums (proceed with caution). AppSafari review of MadPad – Remix Your Life was written by Neema Akhtar on April 24th, 2012 and categorized under App Store, Music. Page viewed 5068 times, 2 so far today. Need help on using these apps? Please read the Help Page.